Gardēz[pronunciation?] 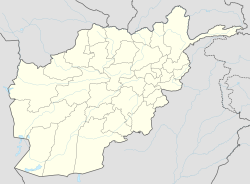 (Pashto: ګردېز‎, Persian: گردیز‎) is the capital of the Paktia Province of Afghanistan. The population of the city was estimated to be ca. 10,000 in the 1979 census and was estimated to be 70,000 in 2008. The population is overwhelmingly Pashtun. The city of Gardez is located at the junction between two important roads that cut through a huge alpine valley. Surrounded by the mountains and deserts of the Hindu Kush, which boil up from the valley floor to the north, east and west, it is the axis of commerce for a huge area of eastern Afghanistan and has been a strategic location for armies throughout the country’s long history of conflict. Observation posts built by Alexander the Great are still crumbling on the hilltops just outside the city limits. the city of Gardez has a population of 70,641 (in 2015). it has 13 districts and a total land area of 6,174 hectares (23.84 sq mi). The total number of dwellings in this city are 7,849. Gardez is an ancient settlement, located in the Highlands of the Hindu Kush. Unfortunately, its history is only very poorly documented. Archaeological discoveries, including Greek, Sassanid, Hephthalite, and Turki-Shāhī coins give a small insight into the rich history of Gardez. Gardez is located at 2,308 m above sea level, making it the third-highest provincial capital in Afghanistan, and is not far from the Tora Bora region of caves and tunnels. The "old town", located at the foot of the Bālā Hesār fortress. The city is watered by the upper course of the Gardez River, which flows into the Ab-i Istada lake. Gardez is located at a junction between two important roads, one linking Ghazni with Khyber Pakhtunkhwa, the other connecting Kabul with Khost. The city is 70 kilometres (43 mi) northwest of Khost and 100 kilometres (62 mi) south of Kabul. Gardez has a cold semi-arid climate (Köppen climate classification BSk) with dry summers and cold, snowy winters. Precipitation is low, and mostly falls in winter and spring. Gardez is located in eastern Afghanistan close to Ghazni and Khost. Gardez is predominately non-built up area with agriculture as the largest land use at 39%. Residential area accounts for almost half of built-up area and Districts 1-4 consist of the densest housing. The Gardez territory fell to the Maurya Empire, which was led by Chandragupta Maurya. The Mauryas restored Hinduism and Buddhism to region, and were planning to capture more territory of South Asia until they faced local Greco-Bactrian forces. Seleucus was defeated and was constrained to arrive at a peace treaty with Chandragupta whereby Chandragupta was given control of the territory around the Hindu Kush including Aria and Bactria to the Mauryas upon intermarriage and 500 elephants. Alexander took these away from the Indo-Aryans and established settlements of his own, but Seleucus Nicator gave them to Sandrocottus (Chandragupta), upon terms of intermarriage and of receiving in exchange 500 elephants. Some time after, as he was going to war with the generals of Alexander, a wild elephant of great bulk presented itself before him of its own accord, and, as if tamed down to gentleness, took him on its back, and became his guide in the war, and conspicuous in fields of battle. Sandrocottus, having thus acquired a throne, was in possession of India, when Seleucus was laying the foundations of his future greatness; who, after making a league with him, and settling his affairs in the east, proceeded to join in the war against Antigonus. As soon as the forces, therefore, of all the confederates were united, a battle was fought, in which Antigonus was slain, and his son Demetrius put to flight. Newly excavated Buddhist stupa at Mes Aynak in Logar Province of Afghanistan. Similar stupas have been discovered in neighboring Ghazni Province, including in the northern Samangan Province. Having consolidated power in the northwest, Chandragupta pushed east towards the Nanda Empire. Afghanistan's significant ancient tangible and intangible Buddhist heritage is recorded through wide-ranging archeological finds, including religious and artistic remnants. Buddhist doctrines are reported to have reached as far as Balkh even during the life of the Buddha (563 BCE to 483 BCE), as recorded by Husang Tsang. In this context a legend recorded by Husang Tsang refers to the first two lay disciples of Buddha, Trapusa and Bhallika responsible for introducing Buddhism in that country. Originally these two were merchants of the kingdom of Balhika, as the name Bhalluka or Bhallika probably suggests the association of one with that country. They had gone to India for trade and had happened to be at Bodhgaya when the Buddha had just attained enlightenment. A 5th century marble Ganesha found in Gardez, Afghanistan, now at Dargah Pir Rattan Nath, Kabul. The inscription says that this "great and beautiful image of Mahāvināyaka" was consecrated by the Shahi King Khingala. According to the medieval Tārīkh-i Sīstān, the city was founded by the Kharijite warlord Hamza bin Abdullāh Shārī, although scholars agree that this is probably only a reference to the Islamic conquest of the city. In any case, Gardez became a center of Kharijite belief for more than a century under the local dynasty of the Aflahids in the distant eastern parts of the Abbasid caliphate.. In 870, the city was conquered by the Saffarid ruler Yaqub ibn Layth. In 975, the Ghaznavids took over the city, while the converted Aflahids entered the Ghaznavid nobility. In 1162, the city fell to the Sultāns of Ghōr. Renowned for its multi-storied houses—as mentioned by the Central Asian conqueror Babur—the city was part of the Mughal Empire in the 16th century. However, nothing is known of the town during the subsequent centuries and no building remains. Today, Gardez is the administrative center of a district of the Paktiā province, which covers 650 km2 and had a total population of 44,000 inhabitants in 1979, but was almost totally depopulated during the Soviet–Afghan War. In 1960 the German government had their biggest rural development project with a budget of 2.5 million Deutsch Marks for the development of Paktiā ("Paktiā Development Authority", see above). The project was unsuccessful as the communist regime came to power in the 1979. The communists lost control of most of Paktiā during the 80s as the country plunged into war with only Gardez remaining in government control. Today Paktiā remains one of the most stable provinces in the southeast compared to Khost and Paktikā. As of 2008, the population of Gardez was estimated to be around 73,131. Pashtun make up ca. 70% of the population while the autochthonous Tajik community accounts for ca. 30%. As explained in the Encyclopaedia Iranica, Gardez is a city "belonging to a network of old isolated Tājīk settlements in southern Afghanistan that are remnants of a time when Pashto had not yet reached the area." but now (year 2015) its population is estimated to be 70,641. Gardez has also a huge Sayed population. However, this population is not counted by statistics. A lot of Gardezi Sayeds have immigrated to Pakistan and India (Gardēzī Sadaat). The city of Gardez is also a major fuel wood market for Kabul. Many of its natural forests are being cut down to provide fuel wood especially during winter. During the 1970s, Gardez experienced an economic boom as a result of the German-funded "Paktiā Development Authority", established in 1965, and of the asphalting of the road to Kabul. Social services included three schools for boys, one school for girls, a hospital, one teacher training institute, the Madrasaye Roshānī, two hotels, and forty mosques. Most of these buildings were destroyed during the civil war in the 1980s. After the fall of the Taliban, the first Provincial Reconstruction Team (PRT) in Afghanistan was established in Paktiā near Gardez in early March 2003, headed by the US Army along with a U.S. Agency for International Development representative, Randolph Hampton. There are now over 30 PRTs in Afghanistan. The continuing challenge to bring electricity, medical clinics, schools and water to the more remote villages in Paktia are a result of ongoing security issues. Gardez was the former home of the 3rd Corps of the Afghan Army. By the Afghan Militia Forces period (c.2002), the corps 'theoretically incorporated 14th Division, 30th Division, 822nd Brigade, Border Brigades, and approximately 800... in the Governor's Force in Paktya, Ghazni, Paktika, and Khost Provinces. The corps was disbanded around 2003-2005 and replaced in the new Afghan National Army by the 203rd Corps. According to local Police Chief Brigadier General Aziz Ahmad Wardak, six people were arrested on 19 August 2009 for distributing night letters threatening people with attacks if they participated in the election. Abu Saʿīd Gardēzī, an 11th-century geographer and historian. He is the author of the general history book, Zayn al-Akhbār or "Tarikh-i Gardezi". Gardezi's work is of great importance to the history of medieval Afghanistan, Persia, and Central Asia. Shah Gardez, an 11th-century Syed saint from Gardez, established himself in Multan, Pakistan. Mohammad Najibullah, the last president of the Soviet-backed Democratic Republic of Afghanistan. After his overthrow, he was killed by the Taliban on September 27, 1996. He is buried in Gardez. Abdullah Mujahid, a militia leader who is held in extrajudicial detention in the Guantanamo Bay detention camps in Cuba by the U.S government. ^ a b "The State of Afghan Cities report 2015". Archived from the original on 2015-10-31. ^ a b c Pike, John. "Gardez". Retrieved 22 December 2016. ^ Scar, Ken (February 22, 2012). "AUP takes the reins from US soldiers in Gardez". U.S. Central Command. Archived from the original on September 23, 2015. Retrieved August 1, 2015. ^ "The State of Afghan Cities report2015". Archived from the original on 2015-10-31. ^ a b c d "The State of Afghan Cities report 2015". ^ "The State of Afghan Cities report2015". ^ "Gardiz Climate Normals 1961-1990". National Oceanic and Atmospheric Administration. Retrieved December 26, 2012. ^ Nancy Hatch Dupree / Aḥmad ʻAlī Kuhzād (1972). "An Historical Guide to Kabul – The Name". American International School of Kabul. Archived from the original on 2010-08-30. Retrieved 2010-09-18. ^ Puri, Baij Nath (1987). Buddhism in central Asia. Motilal Banarsidass. p. 352. ISBN 81-208-0372-8. Retrieved 2010-11-03. ^ For photograph of statue and details of inscription, see: Dhavalikar, M. K., "Gaņeśa: Myth and Reality", in: Brown 1991, pp. 50,63. ^ "Hodūd al-Ālam", ed. Sotūda, p. 71, tr. Minorsky, p. 91; Bivar & Bosworth, 1965, pp. 17 ff. ^ Michael Bhatia, Mark Sedra, Michael Vinay Bhatia, Mark Sedra, 'Afghanistan, Arms and Conflict: Post-9/11 Security and Insurgency, Routledge, 2008, ISBN 113405422X, 209. ^ Farah Stockman (August 12, 2007). "US behind Afghan warlord's rise, fall: At Guantanamo, unruly chieftains join combatants". The Boston Globe. Archived from the original on October 24, 2008. Retrieved 2007-09-18. Wikimedia Commons has media related to Gardez.